At the Amazon.com site you can get it for just $1.99, a 90% discount on the normal price. In the uk it’s £2.99 so not so good but still a great offer. Other amazon stores may differ. You DO NOT NEED a kindle or any other hardware or app. 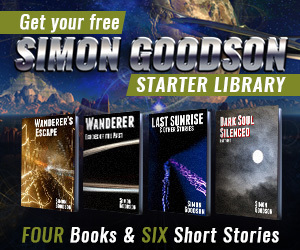 You need to buy (for free) the Wanderer’s Escape kindle book. Whispasync then kicks in, allowing you to buy the audiobook for the huge discount. A caveat – none of this is under my control, it all sits with Amazon, which means the conditions could change or this route to get a cheap book could disappear. I’ve checked it for the UK and US stores, and it may be available for other stores but I’m not certain. Please check that the price for the ebook is free and the audiobook is what you expect before buying.